The five major categories of leukocytes in mammals are neutrophils, eosinophils, basophils, lymphocytes, and monocytes. The first three collectively are called granulocytes, because they contain granules in their cytoplasm, and the latter two collectively are called mononuclear cells in reference to their round nuclei. These collective terms are somewhat misleading since some granulocytes have barely perceptible granules and most monocytes do not have round nuclei. Granulocytes of most mammals are classed as neutrophil, eosinophil, and basophil based on the reaction of their specific granules with the dyes in polychrome blood stains, called Romanowsky stains. 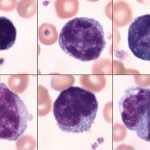 The prototype species for granulocyte classification are humans, in which neutrophil granules are small and pink with weak affinity for azure complexes, basophil granules are deep purple because of strong affinity for the azure complexes, and eosinophils are intensely orange because of strong binding of eosin. 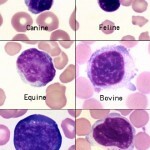 Classification of granulocytes in animal species is based in part on homology of appearance to human granulocytes and in part on demonstration of homology of enzyme content and function. There are many differences, some subtle and some obvious, among species and within species. The segmented neutrophil, or the heterophil in birds, reptiles and some mammals, is the predominant granulocyte. In many species it is the predominant leukocyte in health. In health, usually only mature neutrophils are released from marrow to circulate in blood. Since mature neutrophils in prototypical human blood have nuclei that are segmented into lobes of condensed chromatin connected by filaments, mature neutrophils are called segmented neutrophils (“segs” or “neuts”). The mature neutrophils of many animal species do not have a distinct lobe and filament arrangement (they do have constricted nuclei or irregular/knobbly nuclear outlines), nevertheless, they also are called segmented neutrophils. Neutrophils are part of the innate immune system and are the first line of (and are essential for) defense against bacterial pathogens. Neutrophils have a short half-life – they only persist for 10-15 hours once they have been released into peripheral blood (Carakostas et al 1981). When analyzing blood, we are only sampling the circulating neutrophil pool and not the marginating or reserve pool in marrow. In most species, other than cats, the circulating to marginating pool ratio is 1:1 (Carakostas et al 1981) (it is estimated at 3:1 in horses). Release of neutrophils from the marginating pool occurs in response to corticosteroids (endogenous or exogenous), which downregulate adhesion molecules responsible for margination (or patrolling of the endothelium via selectin-mediated rolling) and has the potential to double the mature neutrophil count (so-called “stress leukogram”). In some animals, immature neutrophils may be seen in peripheral blood and their presence is called a left shift. The presence of increased numbers of immature neutrophils (i.e. above the established reference interval for that species) usually indicates a response to inflammatory cytokines and an inflammatory leukogram. The most common type of immature neutrophil seen in blood is the band neutrophil, which is one stage less mature than a segmented neutrophil. Band neutrophils are distinguished from mature neutrophils by the shape of their nucleus, which lacks the clear segmentation (a segment is defined as a >50% constriction in the width of the nucleus) and irregular outline of the mature neutrophil. Under some situations, stages earlier than bands are released (e.g. metamyelocytes; see below). A left shift is usually (but not always) accompanied by toxic change (toxic change may not be seen if there is a mild left shift or if there is only release of immature cells from marrow without accelerated maturation). However, immature neutrophils can also be released prematurely in bone marrow disorders, such as leukemia or severe bone marrow injury (immature neutrophils are usually not toxic in this setting either). Neutrophil precursors from the blood smear of a cow with severe inflammation. Immature neutrophils are classified based on their stage of maturation. The earliest identifiable specific neutrophil precursor is a myelocyte, which differentiates into a metamyelocyte, then a band neutrophil, and finally to a mature segmented neutrophil. Only the myelocyte is capable of division – all the more mature stages (metamyelocyte, band, segmented neutrophil) are incapable of division (post-mitotic). The primary criterion for differentiating immature neutrophils from each other is the shape of their nucleus, which starts to indent or constrict as the cell matures. A myelocyte has a round nucleus, a metamyelocyte has an indented or kidney-bean shaped nucleus and a band has a horse-shoe or parallel-sided shaped nucleus (for a compiled image of immature neutrophils, please refer to the left shift or toxic change pages). 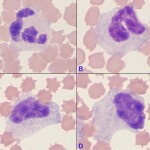 It is important to distinguish between immature neutrophils and monocytes, particularly in the dog where these cells can resemble each other (see monocyte below). This is accomplished by looking at all features of the cell (nuclear chromatin, nuclear shape, nuclear location in cell, cytoplasm color, cytoplasmic borders, presence or absence of vacuoles and granules) in concert (see image to the right). When performing a differential cell count, we classify neutrophils into the “segmented” category if the nucleus has regions that are distinctly constricted (more than 50% of the width of the nucleus) or has lateral protrusions resulting in irregular nuclear margins. A cell whose nuclear margins are smooth and parallel (or nearly parallel) is a “band” neutrophil and should be counted as such. More immature stages are classified by their nuclear shape, as described above. Note that cells between these well-defined stages will always be seen in blood. Under these circumstances, the cell in question will be placed in the more mature category, i.e. a cell with nuclear features halfway between a band and a segmented neutrophil will be called a segmented neutrophil. More immature neutrophils can be counted separately as their specific categories or grouped together as “band” neutrophils. At Cornell University, all immature neutrophils (band neutrophils, metamyelocytes and myelocytes) are grouped into the “band” category of our differential cell count. Using the image above as an example, the cells B through D would be counted as “bands” and only cell A would be counted as a “segmented” neutrophil. However, if we observe stages that are less mature than a band neutrophil (metamyelocyte or myelocyte), we provide this information in the results (e.g. the left shift extends to myelocytes). The presence of these more immature stages usually indicates more severe inflammation than the presence of band neutrophils alone. Eosinophil granules in most animals are orange but there are always exceptions, particularly in exotics. The granules in eosinophils of iguanas and some birds are actually pale blue. In general, nuclei of mature eosinophils are shorter and less segmented than neutrophil nuclei and the cytoplasm, if visible, is pale blue. Marked species variation exists regarding the number, size, and shape of eosinophil granules. The most intraspecies variation is found in dog eosinophils. Marked variation in granule size, number and shape occurs within and between individuals of any breed. A specific and predictable morphologic variant of the eosinophil is seen in Greyhounds, other sighthounds (eg, Whippets, Deerhounds) and in some Golden Retrievers. Eosinophils in these breeds lack visible granules and appear as cells with slightly segmented nuclei, gray cytoplasm, and vacuoles. They are sometimes mistaken for toxic neutrophils or monocytes and are called “vacuolated” or “gray” eosinophils (see representative images of these eosinophils in the dog blood gallery under the hematology album). On the ADVIA hematology analyzer, they drift over into the monocyte gate (contain less peroxidase than neutrophils or normal granulated eosinophils). 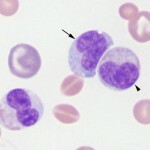 Prototypical basophils of human blood are filled with small, round, dark purple granules. Similar basophils are found in horses, camelids and ruminants. These cells contain many small deep purple granules that obscure the nucleus in many cells. Some basophils have few granules, which probably is the result of degranulation in the sample. Low numbers of basophils are commonly found in blood of healthy cattle and horses, but less so of camelids. Canine basophils are difficult to recognize since many do not have readily apparent granules. This is because the granules are a pale lavender versus purple. The major identifying features of canine basophils are the long and folded nucleus, described as “ribbon-like”, and the unusual gray to lavender hue of the cytoplasm. Some basophils contain a few obvious light purple granules (granules are more easy to see in cells that are ruptured). Basophils are rare in blood of healthy dogs. 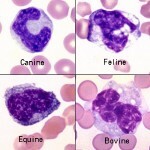 Feline basophils are packed with small, slightly oval granules that are pale lavender rather than deep purple. The nucleus in many appears to have vacuoles, which are actually granules lying on top of the chromatin. 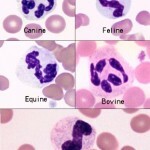 Basophils are rare in blood of healthy cats. Most of the lymphocytes that circulate in healthy dogs, cats, camelids and horses are small (mature) cells that have round nuclei with smooth, dense chromatin and a small rim of light blue cytoplasm. The chromatin is so dense because it is mostly heterochromatin (the cell is not actively transcribing DNA). Lymphocytes must be distinguished from nucleated red blood cells (see below). Some lymphocytes in all species may have increased amounts of very light blue to colorless cytoplasm. These are not called reactive but are just considered to be normal “variants”. Some lymphocytes are slightly larger and have a finer, looser chromatin pattern. 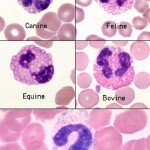 The lymphocytes found in blood of normal ruminants are quite variable in appearance. Many are intermediate lymphocytes with loosely clumped chromatin and fairly abundant cytoplasm. Not all lymphocytes in blood smears are round. Some are distorted into other shapes by the mechanical forces applied to them during smearing and some are molded by contact with red cells. We generally size lymphocytes by their nuclear size in relation to neutrophils (which are the same size across species) as shown in the table below. Also, normal lymphocytes need to be differentiated from nucleated red blood cells, reactive lymphocytes and neoplastic cells (which could be myeloid or lymphoid). More information on this is given below. Large Neutrophil can fit inside the nucleus. “Reactive” lymphocytes are associated with an immune response. They can vary in size (small to large), but have clumped (heterochromatin) chromatin and usually increased amounts of deeper blue cytoplasm that is quite smooth. Some can have clear cytoplasmic vacuoles. It is important to differentiate reactive large lymphocytes from “blasts” associated with a leukemia (see below). We use a variety of techniques to distinguish between them including cytologic features, clinical findings, and the rest of the hemogram results. Reactive lymphocytes can be seen in any animal but are fairly common in the blood of young animals, especially ones that have been recently vaccinated. 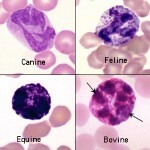 Granular lymphocytes: These are also found in low number in healthy animals (comprise between 1-10% of all lymphocytes). Granular lymphocytes are distinguished by the presence of small red granules collected into one area of the cytoplasm, usually within an indentation of the nucleus. Granular lymphocytes are either cytotoxic T cells or natural killer cells. Increased numbers of granular lymphocytes can be seen in reactive conditions (e.g. Ehrlichia canis infection in dogs, chronic renal disease in dogs) or as part of a primary leukemia (leukemia of granular lymphocytes). Very late stage nRBCs, such as the metarubricyte, are distinguished from lymphocytes by their polychromatophilic cytoplasm and pyknotic nuclei. Earlier stages, such as the basophilic rubricyte, though more of a problem, have a deeper blue cytoplasm and a more coarsely condensed chromatin pattern compared to the lymphocyte. The overall context of the smear can also be factored in; e.g, nRBCs would be expected to accompany marked polychromasia (regenerative response). This is not true of camelids and cats, where nRBC are frequently seen in blood in various situations, not only regenerative anemias. It is important to distinguish large reactive from neoplastic hematopoietic cells (“blasts”). The latter are not seen in normal animals but only in animals with hematopoietic neoplasia (acute leukemia, lymphoma with a leukemic phase or rarely in myelodysplastic syndrome). 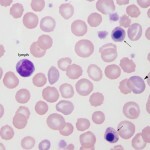 Note that differentiating reactive lymphocytes from leukemic “blasts” can be very difficult in animals with low numbers of problematic cells, so-called “big blue” cells. The presence of neoplastic cells indicates a leukemia, whereas reactive lymphocytes indicate antigenic stimulation (very different meanings). The reason we call the cells “blasts” is because we cannot conclusively determine their lineage by their morphologic features; other tools, such as immunophenotyping and cytochemical staining are required. For more information on how we distinguish between these two very different types of leukocytes in blood (reactive or neoplastic), refer to the “big blue” cell page. Monocytes are the leukocyte that is the most problematic for identification, because they can be fairly variable in size and appearance. They are often larger than neutrophils and are usually the largest leukocyte, but there are no consistent species differences. The nucleus can be round to kidney-shaped to pseudo-lobulated (can mimic a neutrophil). It can even occasionally be band-shaped, especially in dogs, and may be confused with band neutrophils. However, the chromatin of monocytes is less dense than neutrophils, and is described as lacey to slightly clumped. The cytoplasm is usually smooth and blue-grey and may contain a few variably-sized vacuoles, and occasionally a few very fine pink-red granules. Some, like the equine monocyte, resemble lymphocytes. The texture of cytoplasm in a monocyte is slightly grainy or coarse compared to lymphocyte cytoplasm, which is very smooth and glassy. Interpretation of changes in individual leukocyte numbers and presence of abnormal leukocytes in blood, e.g. mast cells, histiocytes. Morphologic features of nRBC and interpretation of increased numbers in blood. Morphologic features of toxic change in neutrophils.